No matter what you do to child-proof your home, toddlers are capable of just about anything. From finding and eating small objects to falling into sharp items to breaking your finest glass figure, mistakes easily happen. 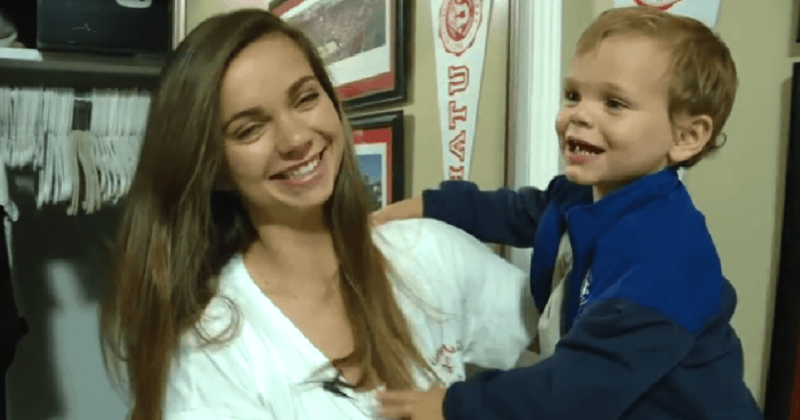 But these parents were not expecting what their precious son was going to do. 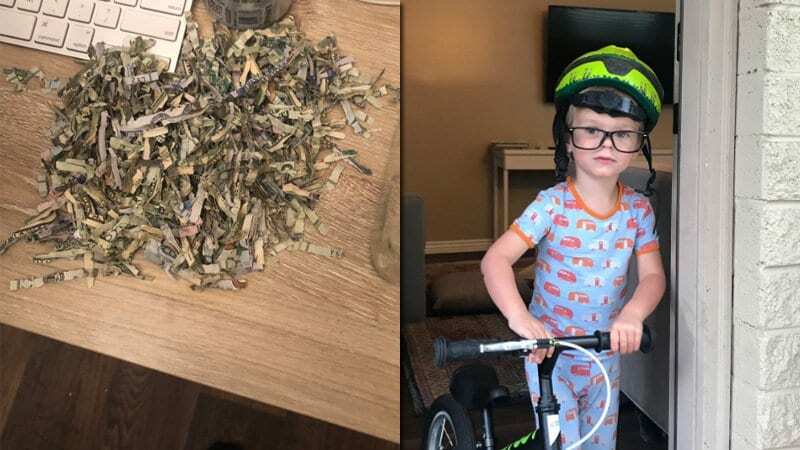 Ben and Jackee Belnap’s 2-year-old son Leo found an envelope filled with cash that was laying on the kitchen counter of their home in Holladay, Utah. The Belnaps had been saving up to pay Ben’s parents back for University of Utah football season tickets. They had finally scraped together $1,060 and placed the cash in the envelope, ready to be delivered. 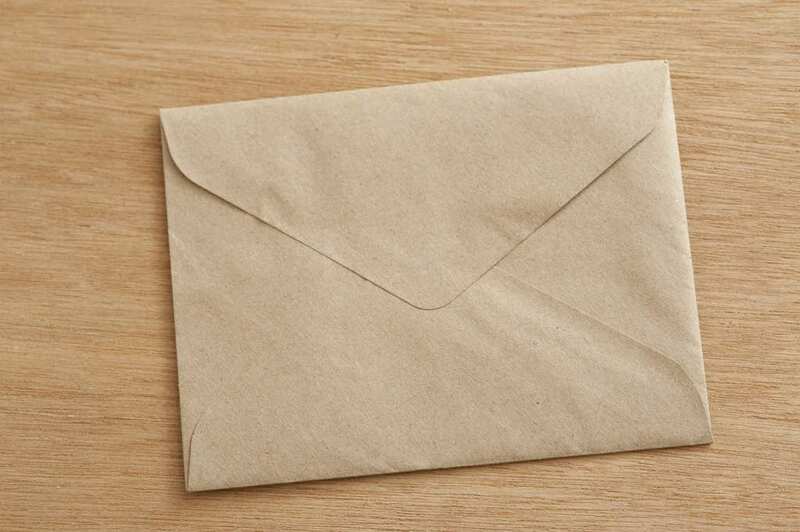 Apparently, Leo had a fondness for the paper shredder and occasionally would help his parents destroy junk mail or other documents, so when he saw the envelope, he thought it necessary to help his parents out and shred the envelope containing a great stash of money. Although Ben and Jackee were initially devastated regarding the loss of their large savings, they finally were able to laugh about the situation. “For like five minutes, we just shuffled through it, not talking. We didn’t know what to do and then I broke the silence and I’m like, ‘Well, this will make a great wedding story one day,’” Jackee said. However, Leo’s parents were in luck. The US Department of the Treasury can reimburse people for mutilated currency as a free public service, provided that the pieces of the bills can be returned. Ben made a quick phone call to the bureau and put all the remnants of the money into a plastic baggie and mailed it to the department. 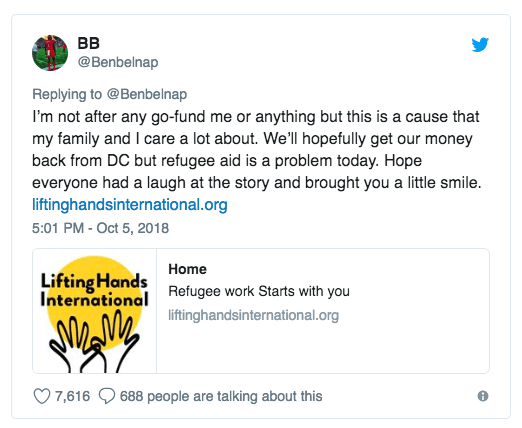 Ben also took to Twitter to post about the humorous incident, Some social media users saw this and tried to start a GoFundMe to reimburse them for their savings, but the Belnaps politely declined the offer. Instead, they asked their followers to donate to the Refugee Aid charity. In the meantime, the Belnaps “hope everyone had a laugh at the story” and they’re reassuring concerned followers that the paper shredder is now far out of reach of Leo.